Folding Security Gates are your number Theft Prevention Solution. Provide a safer, better ventilated and more secure location with accordion style folding scissor gates from Tampa Bay Security Gates. 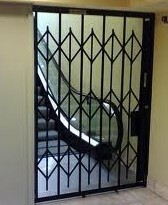 Galvanized steel folding gates are the strongest scissor gates you can buy. 2. they’re rust resistant and they look better and last longer! Our galvanized coating bonds to metal or steel 10 times stronger than paint. That means they’ll be almost maintenance free and we’ll custom make almost any steel folding gate for your business or home! Just tell us what you need, and we’ll find a solution.